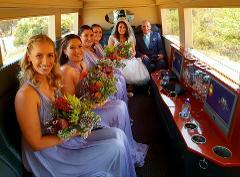 Luxurious transfer of bridal party to ceremony. Followed by a fully escorted photography session with your bridal party, celebrating together in one vehicle. Spectacular arrival at your reception.